The founding of Graff Diamonds in 1960 by Laurence Graff marked the start of an astonishing journey spanning over five decades. Throughout its rich history, Graff is said to have handled more diamonds of notable rarity and beauty than any other jeweller, and to this day continues to inspire and excite the world’s most discerning clientèle. An avid collector of modern and contemporary art, a world leader within the diamond industry and an equally devoted philanthropist, Laurence Graff opened the doors to Delaire Graff Estate in 2009. Having transformed the Estate into an extraordinary luxury destination – The Jewel of the Cape Winelands – nestled in the heart of South Africa’s Stellenbosch Valley. Designed with the discerning global traveller in mind, savour breathtaking, uninterrupted views of the Stellenbosch Valley. Striking Cape Dutch architecture meets African artefacts and styling, with original art from Laurence Graff’s personal collection. Enjoy award-winning wines from our state of the art winery, dine in flagship restaurants and book a stay at one of our Lodges – the ultimate in privacy and exclusivity. 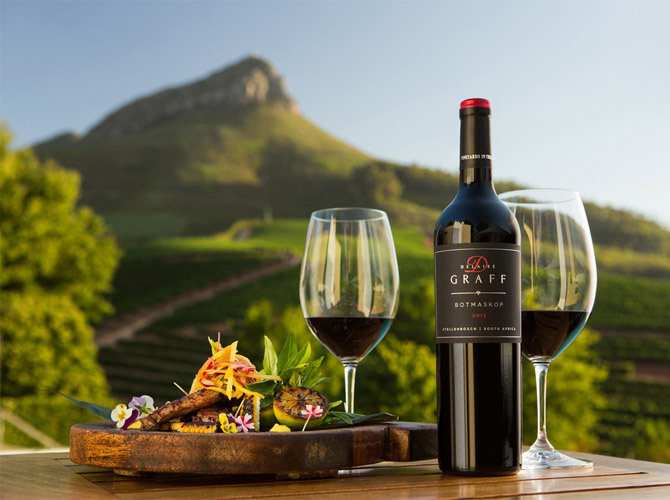 Known as the Jewel of the Cape Winelands, Delaire Graff is nestled in the heart of South Africa’s Stellenbosch region on the crest of the panoramic Helshoogte Pass in the Banghoek Valley. The 20 hectares of Delaire Graff Estate Vineyards are rooted in some of the oldest soils on earth and enjoy the combination of maritime and mountainous terrior. Plantings are predominantly Bordeaux varietals and Chardonnay, all picked and tended by hand. A long, slow ripening season ensures world-class clarets and red wines big in structure with soft tannins and elegance. The grapes received four hours of skin contact to acquire the perfect colour. The grapes were gently pressed, fermented for almost 3 weeks at 14˚C and then left on primary lees post fermentation. The wine is made in the same style as Sauvignon Blanc from vineyards to cellar to maintain the lovely fresh fruit characters. The classic maritime Sauvignon Blanc, made from grapes sourced from four premium wine regions, reveals aromas of cut grass, asparagus and hints of citrusy tropical fruit. The grapes did not receive any skin contact and were gently pressed. Fermentation lasted 3 weeks at 15˚C. The wine was left on its primary lees for 5 weeks post fermentation and and after blending and extra 3 months on fine lees. The grapes received partial skin contact and were gently pressed, retaining freshness. Fermentation lasted 3 weeks at 15˚C. A 4% Semillon component was fermented in new French oak barrels for 3 weeks, adding additional body and dimension. It was left on the lees for 5 months post fermentation, adding to the depth of flavour. Extensive bunch sorting formed part of the quality management process. The grapes were whole bunch pressed with no sulphur added and barrel fermented for 14 days. Maturation took place in French barrels for 10 months with 60% in 400 litre barrels and 40% in 2500 litre barrels. No batonage or malolactic fermentation took place, in order to retain freshness. Extensive bunch sorting formed part of the quality process. The Semillon was whole bunch pressed and the Sauvignon Blanc was destemmed and crushed. Both were barrel fermented at 17˚C for 20 days. Maturation took place in 225l old French oak barrels for 5 months. The wine was then blended and kept in tank on primary lees for an additional 8 months. Extensive sorting of the grapes formed part of the quality management process. The grapes were de-stemmed only, not crushed, to ensure gentle extraction of fruit flavours. Whole berry fermentation and gentle punch downs ensured extra care in handling of grapes. After basket pressing, the wine matured in French oak barrels for 16 months where malolactic fermentation took place.